CLARKSDALE – Celebrating the 100th birthday of Tennessee Williams on March 26, 2011, in his childhood home of Clarksdale has escalated into a multi-faceted spring festival, according to organizers at Coahoma Community College and Mississippi tourism officials. “We are excited to be joining global tributes with a very special brand of events unique to our hometown immortalized in his great Delta plays: “Cat on a Hot Tin Roof,” “Summer and Smoke,” “Orpheus Descending,” “Baby Doll,” and many others,” agree committee members Yvonne Stanford and Eva Connell. “The Williams Centennial celebration is attracting enormous interest across the U.S. and abroad,” comments Kappi Allen, Coahoma County tourism director, who has mailed hundreds of announcements publicizing the Clarksdale event. Highlighting the celebration will be a screening of the Tennessee Williams documentary, “The South Is Everywhere,” being aired on Public Television in Europe on the same day and recorded during Clarksdale’s 2010 Williams Festival by filmmaker Herbert Krill of Vienna. Invited to attend the screening at the Delta Cinema, Krill plans to bring his wife to Clarksdale and will speak about his experiences recording the documentary. Author of numerous publications about the American theatre and English professor at the University of Alabama, Dr. Voss has participated in Williams Festivals for decades. Kicking off activities will be tours of St. George’s Episcopal Church where the playwright’s grandfather served as rector for 16 years and porch plays in the historic district featuring scenes from Williams plays performed by Theatre Oxford actors Johnny McPhail and Alice Walker, Clarksdale’s Sherrye Williams and others. However, Walker also portrays Blanche from A Streetcar Named Desire, and McPhail as the traveling salesman in The Last of My Solid Gold Watches that was set in Clarksdale’s Alcazar Hotel. Williams is well-known for her signature role as Amanda Wingfield from The Glass Menagerie. Making a January research trip here was director Eda Holmes who is directing a production of Cat on a Hot Tin Roof that will run from April through November in the prestigious George B. Shaw Festival in Toronto, Canada. Schedules and other events of the centennial celebration will be announced on the festival’s website: www.coahomacc.edu as well as plans for the 19th annual major Williams Festival on October 14-15, 2011. Many settings and characters in his plays including Brick, Blanche, and Baby Doll are based on real sites and citizens he remembered while living in the St. George’s Episcopal Church rectory with his mother, sister, and grandparents. 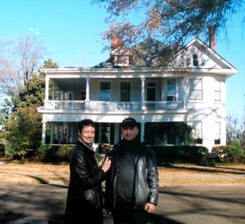 The rectory has been dedicated as a National Literary Landmark, and the site is included also on Clarksdale’s Walk of Fame. Free and open to the public, Clarksdale’s Williams Centennial Festival, is being sponsored by the Mississippi Delta Tennessee Williams Festival through Coahoma Community College and the Coahoma County Tourism Commission. During the centennial week, members of the local Tennessee Williams Festival also will be assisting with events of the annual Delta Literary Tour of Clarksdale on March 23 sponsored by the University of Mississippi ‘s Center for the Study of Southern Culture. The Williams Festival is affiliated with the Southern Literary Trail honoring writers and artists in Mississippi, Alabama, and Georgia. Theatre director Eda Holmes and her husband, Tim Holmes, enjoy an extensive research trip to Clarkdale including its historic district in preparation for the production of the Tennessee Williams play, ‘Cat on a Hot Tin Roof,” that will run April through November at the George Bernard Show Theatre in Toronto.